So far I’ve not received any further information about the Donkey Steps and Gibson Square, and certainly no photographs. Therefore I’ve decided to draw a rough sketch of both from my own memory of them over 70 years ago. I found this rather difficult as I was trying to draw something I couldn’t see and could only vaguely remember in an imperfect way. This has resulted in a pretty awful drawing. Still, this might start a few other memories stirring and I might possibly end up with a reasonably accurate drawing. 1. Do you know what two buildings were on either side of the entrance to the steps on the Bell Pitch? 2. Do you know how many steps were in each flight and how many flights there were? 3. I know the steps were curved. Have I got the curve more or less correct? 4. 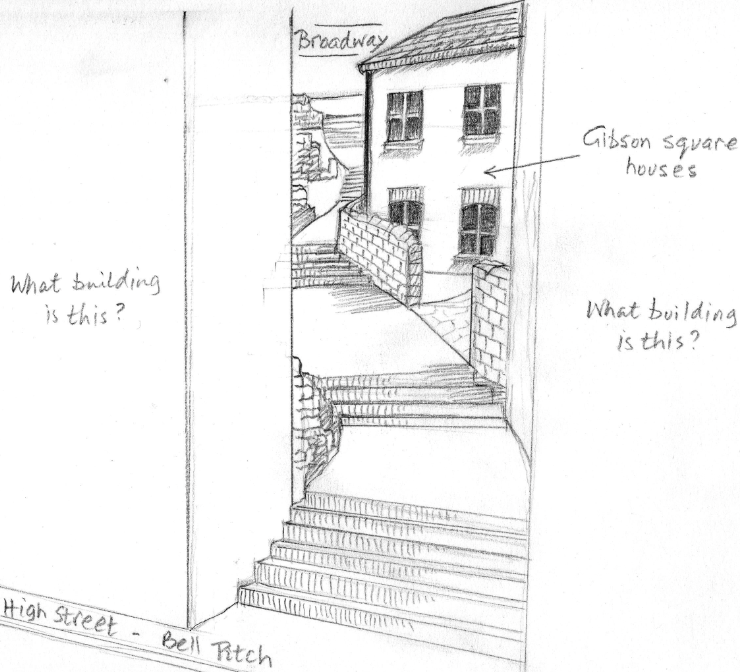 Were the Gibson Square houses two or three storeys? I remember that the wall in front of the Gibson Square houses was short enough for us to look over the top and down into the bottom floor of the houses which was below ground level. Please email me with any information you might remember or leave a comment. This entry was posted on May 23, 2011 at 10:54 pm and is filed under information, Places around Pontypool, Scenery. You can follow any responses to this entry through the RSS 2.0 feed. You can leave a response, or trackback from your own site. A neat sketch, David. In “my day” there was a butcher’s to the right of the steps as you looked up. Whether it was immediately to the right, I’m not sure. Think there may have been a house on the left. The house at the top had disappeared & there was little evidence of houses there but my menories are from the 50s. Remember a hedge running along the top to the right as you walked up, think some of the land the other side of it was used for the growing of vegetables during WWII. Not sure whether from the bottom of the steps, you could see the top. Think the top curved out of sight but it is a long time ago !! Also seemed quite long but, then, things seemed longer, bigger. On returning in adulthood, it is surprising how small many of the places are. To the left of the steps stood a red brick house in which a Mr Evans used to live. He played drums with a guitarist /singer in the local clubs. He later moved to the flats on Broadway. lived on Crumlin street,for a big part of my life and didn’t know it was called Gibson square! Have just been on FB commenting on the lack of photographs of Pontypool as it used to be. Some one must have taken photos of places as they were being knocked down? I wish I had. Looking over the wall there was a fair drop down to the base of the three storey houses. Jeannette Randall nee Osborne Northants. The drawing is very good and just as I remember it. I loved in the house on the left hand side of the Donkey Steps. This building was once The Victory Pub but converted into a house during the war years. My parents Tom And Phyl Osborne rented this property after being bombed out in Coventry where my father was working. I lived there in1941/42. I can remember Francetti’s and Elsie and also Kilka looking over the wall a little way up the steps. At the top of the steps on the right, on Broadway, the “Lotties” (allotments) were behind an old stone wall. Some big flowering currant bushes grew there and the wall was covered in “Snow on the Mountain”. As children, this was a favourite playground. there was a gap in the fence at the corner. The Broadway side was wire fenced with rough hedging inside and pretty impenetrable.